The il Borgo Agritourism Complex is near the historic Etruscan city of Cortona. 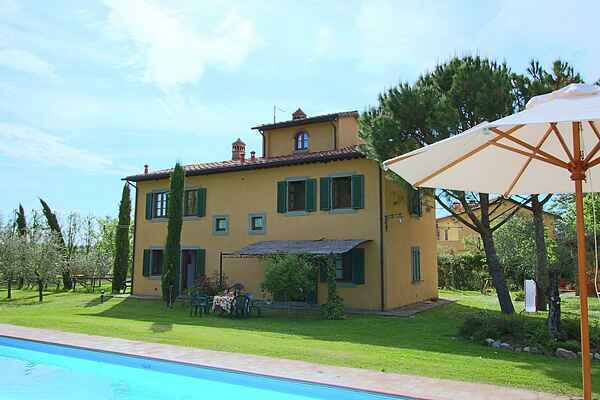 It is in a beautiful country setting amongst olive trees, cypresses and sunflowers in the Chiana Valley. The Due Olivi Apartment is in a new house next to an older, rustic dwelling with a number of apartments. Due Olivi is reminiscent of the simple, elegant style of 200 years ago with its wooden ceiling beams and earthen floor tiles. There is a spacious garden and a communal swimming pool. The agritourism complex is excellent for visiting Cortona, Arezzo, Siena, Perugia, Assisi, Lake Trasimeno, Montepulciano, Pienza and Montalcino.